ESK is built with passion, because when you love what you do you never work a day in your life. ESK Productions offers companies unique and innovative branding solutions that will leave a lasting impression and inspire others. We are a full-service, mobile marketing and design company specializing in the customization of iconic Airstream travel trailers. Using knowledge and experience from two generations in the field, we transform abandoned classics into marketing machines. Our sights are set on being the East Coast's premier Airstream customization shop. We aspire to place the bar for innovation and quality as high as it can go... and then some. While most designers choose static walls or brick and mortar to work with, we prefer Airstreams as our blank canvases. Their shiny silver exteriors, compound curves, and uniquely small spaces call to us. It takes a high level of creativity and resourcefulness to work with these aluminum beasts, requiring a special skill-set and an abundance of patience to tackle. We have developed the necessary techniques and expertise needed to innovate the classic travel trailer to its fullest potential. Even outside of Airstream work, we still love to combine metal, interesting wood and vintage pieces to create furniture and decorate spaces. We are inspired by old signage, clean lines, and furnishings that are as practical as they are beautiful. ESK Productions is built with decades of knowledge, design experience, and a love for Airstreams. Qualities handed down from an expert craftsman to his son. From a very young age, construction was a huge part of Justin's life. 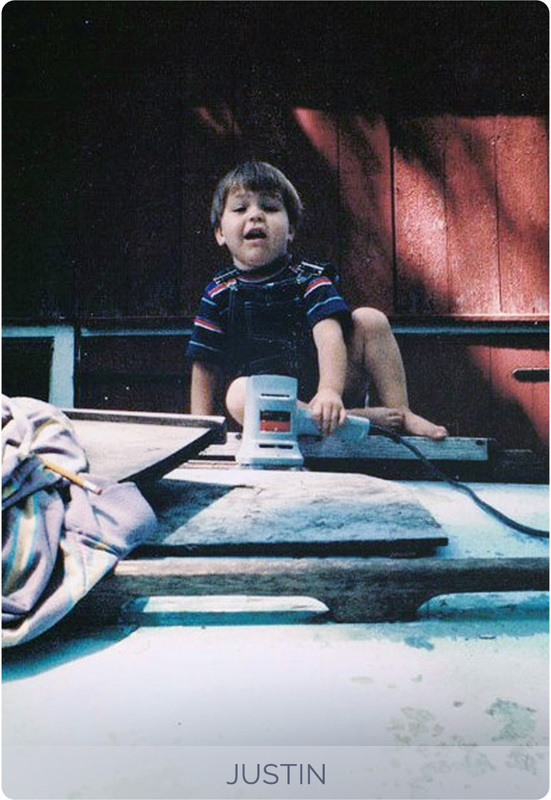 At 4 years old he was given a sander as his first tool. From that moment on his fate was sealed. Working alongside his father, Tad Taylor, one of the first Airstream renovators, he learned the ins and outs of the industry. Tad was a seasoned veteran in the trade, known for his work with housing for people with multiple chemical sensitivities, knowledge he passed down to his son. Founding this company was not Justin Taylor's first encounter with Airstream restoration. Justin's love affair with Airstreams began in the early 90's when Tad pulled one into their yard as a prototype project. From that moment on, they were hooked on the shiny exteriors and unique structures inside. It was at this time Tad began developing safe living environment options for people with Multiple Chemical Sensitivities (MCS). This was a great success due to the Airstream's solid metal frame and ability to be completely gutted to create a new, clean environment. These chemically-free trailers became such a hit they couldn't keep them on the lot. At the peak of this venture they reached close to 20 units on the property at a time, and produced countless refurbished trailers before Tad's passing in 2006. After losing his father, Justin continued Tad's legacy in the restoration of Airstream trailers. This led to him opening the doors to his very own shop, Taylor Design Healthy Homes. Justin is first and foremost an Airstream guy. He began ESK Productions to expand his focus, combining his love for strong design & impressive craftsmanship inside different structures. 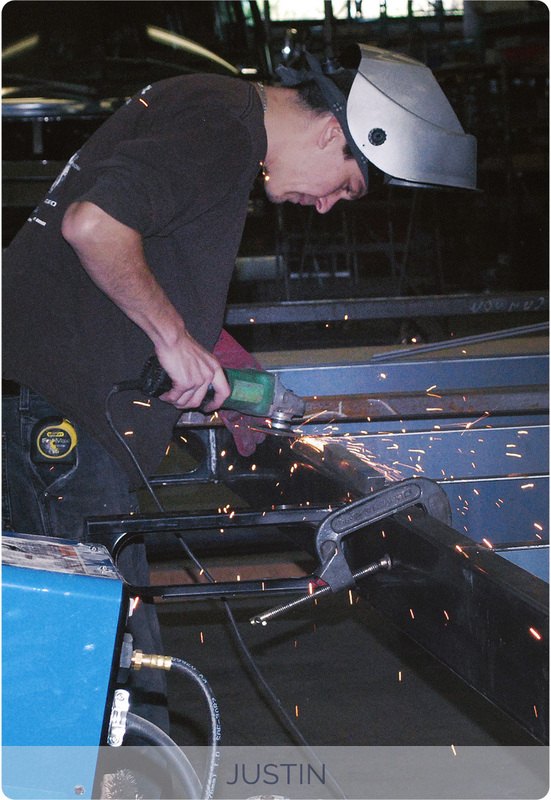 From timber framing to sheet metal, he's worked in all facets of construction throughout his career. Deni is an international designer who uses her background in design, traditional art, and 3D computer animation to bring Airstream renos and branding to the next level. Her goal is to bring a creative, fresh perspective to this industry. Resulting in fully immersive, compact environments. When we say our team is family, we mean it. New to the ESK crew is Justin's younger brother, Forest. His eye for detail and incredible work ethic make him a perfect fit for a fabricator in this shop. He has a background in woodworking, timber framing, and carpentry. Justin has an extensive background in Airstream restoration and the outfitting of chemical free homes. He combined safe materials with aesthetically pleasing design to help those with chemical sensitivities. We've been having a blast sharing behind the scenes footage of a-day-in-the-life-of an ESK artisan. This site has given us the perfect spot to share progress and stories of the incredible things we get to work on. Facebook has been an amazing way to connect with people as passionate about vintage vehicles and design as we are. If you want to chat with our team or ask about what we are working on, that's the place to do it! We've begun to build an in-depth log of what goes through our doors. We are adding articles, tips, and how-tos along the way to explain how we achieve the results we do. Follow along as we grow this feature! We are proud to be located in the heart of beautiful Southern Vermont. The “Green Mountain State” got its name from its breathtaking mountains and stunningly vibrant colors. With every season bringing new life to a host of activities such as recreation, sports, and tourism, so there is always something new and exciting to do. The perfect landscape for extreme sports and natural living, it's not hard to see why ESK set up shop here. Whenever possible we deal with local distributors and artisans in order to keep Vermont's economies thriving. It is important to us to work in-state every chance we get, offering a high level of quality control and developing an active network within our community. We also love using natural elements from our environment. We incorporate beautiful locally grown or reclaimed wood into our designs to make the whole project truly unique. We are beginning the Made In Vermont Initiative to bring light to great companies from this state. Our first product for the apparel line features a soft-blended shirt with a water-based ink graphic. Show the world you are part of the pulse that keeps Vermont going. Be proud you are from, craft in, or leave your heart in the state of Vermont. #MadeInVT across social media to show us your work! Contact us if you'd like to purchase one! Since we strongly believe in supporting our community and companies alike, we want to highlight others doing the same and offer some connections here to help grow local business. Here are our Made In Vermont, Local Spotlight Companies. "Vermont Barns is the barn division of The Wadsworth Company, a custom timber framing, woodworking and home building company dedicated to excellence in design and superb craftsmanship. Our Vermont craftsman utilize the same traditional skills to meticulously craft warm and beautiful barns from start to finish." Justin has worked with this company to create some stunning interiors, reclaimed floors, and timber frame structures. If you are in their area and looking for traditional hardwood elements in your design, check them out. They are located up the road from Stratton Mountain and have a portfolio that speaks for itself. "For more than 15 years, Vintage Trailer Supply has been the industry leader in developing authentic reproduction parts for vintage travel trailers from the 1940s through 1970s... We have the largest selection in the world of hard-to-find and formerly obsolete parts for collectible aircraft style and wood framed vintage trailers." Justin and Tad have worked with Steve at Vintage Trailer Supply for a few decades now. They have reliable and well-made products that are always being added to using innovative technologies and an expertise in travel trailer designs. Our friend, Chef Zachary Corbin, took over this local gem in 2012 and has since kept their traditions alive and well. His talents in and out of the kitchen show bright. "Zach continues the Peter Havens tradition of providing fresh, beautiful and consistent food. A native of Vermont, Zach uses his fifteen years of culinary experience to focus on the local bounties of the green mountain state, putting out thoughtful and inspired meals night after night." Their quality of food, service, and the atmosphere is unbeatable, so we highly recommend a visit! You won't be disappointed! These guys are not only talented and really down to earth, they are incredibly invested in this community and offering superior products. "Through the use of historical brewing processes, oak casks, and new green technologies, we make exciting, yet accessible, beer while keeping an eye on minimizing our environmental impact." Not only does their product taste good, you can feel great about drinking it. Some of their delicious flavors now come in cans. So if you can't visit their stellar location, at least you can enjoy their brews at home. This snow and skate shop has been around for as long as most can remember, moving from location to location as it grew. This year founder Pete Ripley settled down in his dream location. Positioned minutes from Mt Snow, the space is massive and now filled with this season's newest styles. When looking for gorgeously made, unique furnishings for your home or office Candle is the place to look. Their collection is drool worthy and located right on Main Street! Today our showrooms, which occupy over 11,000 sq ft, are overflowing with the creativity of countless artisans and craftsmen who have mastered a variety of nearly forgotten skills." In the end, without the support, teachings, and love of Justin’s dad Tad... ESK probably wouldn’t have existed at all. Growing up in Tad's shop, Justin developed his strong work ethic and specialized building techniques directly from his Pops. His attention to detail and care for people who needed a better living environment are inspirational. Tad’s spirt and the techniques he developed will forever be a part of ESK. We still struggle every day with the sudden loss of our mascot and best friend Duke in September. He was by our side through the good days and the bad. He always lifted our spirits, went on Airstream adventures with us, and made quick buddies with every client that met him. We will miss him deeply and try to keep his memory alive in the shop by taking time to stop and play or make each other laugh when things get too serious.